If you head over to our new Chester group, you will be sure to notice a bubbly, smiley and sociable member of the group called Sarah. Sarah self admittedly never had the motivation to keep up her excise habits previously and hadn’t played team games for over ten years. However she has now been a committed member of Rabble for 5 months and it’s now one of the highlights of her week! 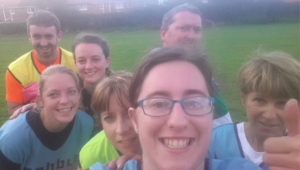 Initially not a super keen runner, she now commits 100% to the sessions and is building towards 5k! Both Chris and Caroline, our Chester instructors, are very impressed with her progress so far. Sarah is also a great character to have in games, always going above and beyond including dressing in theme (she’s a Hufflepuff) for our Quidpitch games! My name is Sarah and I’m 25. 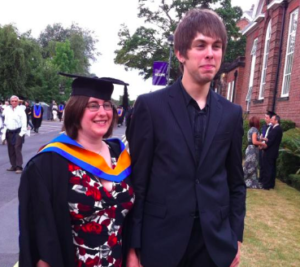 I work as a recruitment administrator for Cheshire West and Chester Council. I went to University in Leeds but otherwise I have lived in Chester my whole life. 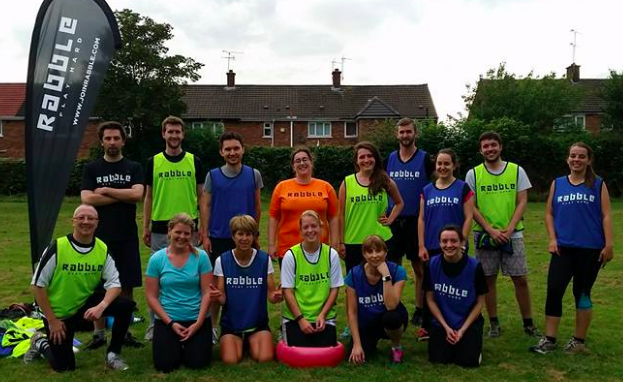 What exercise did you get up to before Rabble? My other half is a fanatical cyclist, so I’ve always made a token effort to join in with his cycling trips, whether mountain biking or road cycling. I also enjoy swimming and badminton but never had the motivation/money to do it regularly. 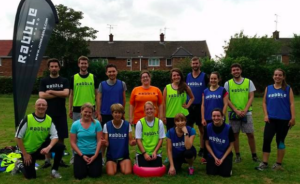 How did you get into Rabble? I was invited to an event on Facebook by my mum and her friends Liz and Paul. I wasn’t sure what to expect, I hadn’t played team games for almost 10 years and I had no idea it was part of such a big thing, I thought it would be a one off! My first session was very hard, but great fun. It was a freezing cold April morning but I still had a smile on my face and was genuinely gutted when I realised I might not be able to afford to keep coming due to unemployment. Luckily my mum stepped in to pay for my subscription but now I’m happy to pay my own. How long have you been coming to Rabble now? Since April, so 5 months. I’ve made great friends and my fitness and co-ordination skills have absolutely improved. 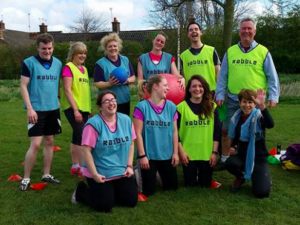 The Rabble socials are fantastic and are a highlight of my week when they’re planned! Do you have a favourite Rabble moment? After a very rainy week, we did Rabble on a rather muddy field, and I managed to tag someone with just one finger and he fell over on a big of mud, but everyone thought I’d pushed him over with 1 finger … superpowers!!! He was over 6ft tall and I’m 5’2! What’s happened since joining Rabble? I had attempted to get into running as my mum and dad go running regularly but I never managed to commit. However since joining Rabble I’ve got to week 6 of the couch to 5k. It’s taken me longer than 6 weeks, but it’s a marathon not a sprint!! My other hobbies are going to the cinema (I’m a member of my local cinema), playing PC games, and watching TV shows such as CSI, Criminal Minds and Once Upon a Time. I am very excited to be able to say Rabble and running are now genuinely hobbies of mine too. What do you want to conquer next? I’d love to be able to run a 5k regularly, I am also interested in triathlons which might be something I’ll look into soon.